Bring your notepad and pencil for this detailed technical discussion of space-time travel. 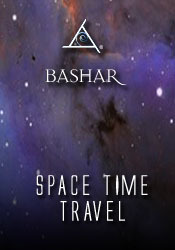 Bashar suggests that if we’d like to go back in time, we might do well to think of it as sliding across the timelines instead. In that way we can learn to pick and choose which parallel realities we would like to visit, and when. This session complements The Council of Nine Codex in terms of how to choose the versions of ourselves we most prefer. Bashar’s advice – both spiritual and technical – in this gem from the archives is even more relevant today in this time of acceleration.